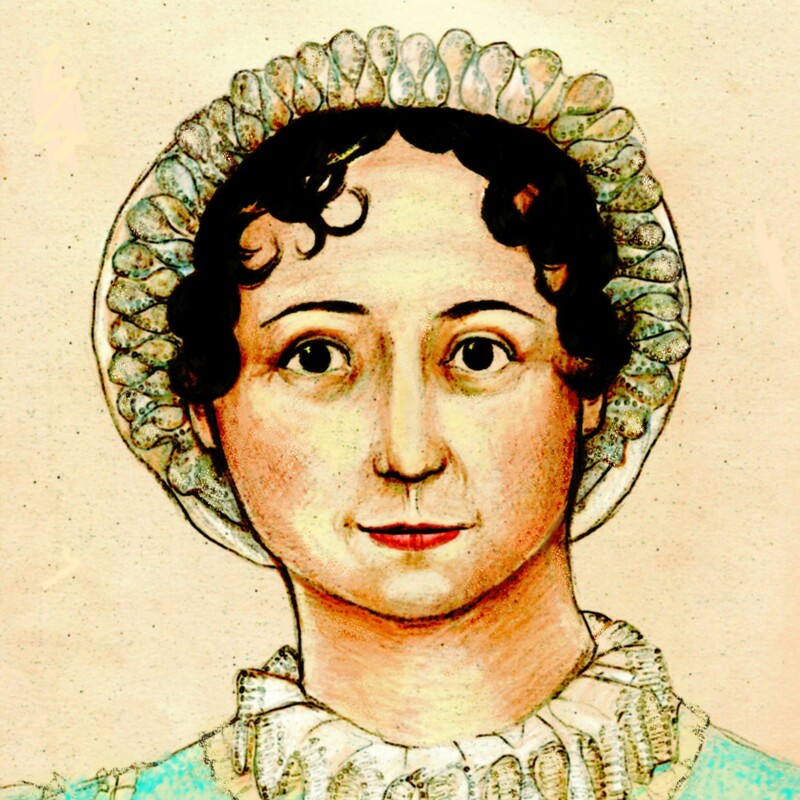 For more than 40 years Jane Austen’s death in 1817 has been attributed widely to Addison’s disease, a rare condition that only became treatable widely with drugs in the early 1950s. However, after a trawl through the author’s papers, an expert in the disease has concluded that the author is more likely to have died from bovine tuberculosis, then common and probably contracted from drinking unpasteurised milk. In March 1816, Jane’s uncle, Mr. Leigh Perrot, died; he had long promised to leave some of his large fortune to his sister, Mrs. Austen, and his nieces, but when the will was read, everything was left to the capricious fancy of Mrs. Leigh Perrot (and indeed she dangled her fortune, carrot-like, in front of Jane’s brothers and nephews in her later years, to get them dancing to her tune). This was another shock to Jane’s system. And let’s face it, Jane wrote and published four books in four years, and gained herself a measure of fame and even a little pewter. While that is a good kind of stress, it is stress nonetheless. It seems to us to be quite natural that the symptoms of an autoimmune disease would be exacerbated by these events, and wear down her body so that she was unable to fight off the little bugs that pass through our bodies unnoticed under normal circumstances; and ultimately, it seems to us that the nature of Jane’s final illness is not really important. We’ll never know, and it’s not the most pleasant subject about which to speculate in our opinion. ETA 2: Hee–the comments in the post about this on Jezebel are HIGH-larious, particularly the CSI: Miami references (AND A CARTOON OH EM GEE). I have a hard time picturing Jane and Cassandra sitting around the parlor with milk mustaches. My understanding of the period is that, after childhood (and sometimes even before), people drank water, tea, coffee, hot chocolate, small beer and wine. Gin if you lived in Hogarth’s gloomy world. With the exception of Jane, the immediate Austen family (parents, siblings) were exceptionally long-lived. If they’d all grown up swilling unpasteurized and tainted milk, surely more of them would have exhibited symptoms. I understand that Jane’s presentation does not fit 100% with Addison’s disease, but that that diagnosis is still pretty strong. Regardless, neither disease could have been treated in that time. As well as overwhelming exhaustion, patients with adrenal failure typically report weight loss, loss of appetite and dizziness on standing. Nausea, muscle weakness with cramps, abdominal, joint or back pains are often present. A preference for salty foods and increased thirst are common. Key signs are deepening skin pigmentation, low blood pressure and a drop in blood pressure on standing (postural hypotension). Symptoms reported by patients are shown in the chart below. As this identifies, few patients report the full complement of symptoms. Considering Jane Austen’s complaints (back pains, general weakness, skin colour changes) expressed in her letters and described by her siblings, it seems the Addison’s desease is the most likable cause for her death. My understanding is that noting else really explains the skin color changes except Addison’s Disease. One interesting assessment I ran across recently theorized that Austen suffered from the complaint for years before the symptoms became serious. Some modern fringe medical sources believe there is a condition called “Adrenal Fatigue” a precursor to Adrenal Failure = Addison’s Disease. This assessment further stated that Austen’s comments about “a brown complexion” meant that she had one and that it was due to Addison’s Disease. And if you look for early stress in her life it’s certainly there. Consider how she fainted when she learned the family would move to Bath. Also Addison’s Disease itself makes dealing with stress difficult because the adrenals can’t produce enough cortisol for the body to “keep up” with life. Not sure if I buy the early AD suffering theory but it is interesting. I keep thinking I had always related Addison disease with TB in the kidneys, so this new theory doesn’t seem to provide anything new for me, but of course I have no medical knowledge. While I have always questioned the Addison’s disease theory simply because of the relative rarity of the disease compared to blood/lympatic cancers, the skin pigmentation issues do certainly seem indicative of the disease and Cope’s original 1964 paper is certainly makes a compelling case. Addison himself pointed out that the disease is usually caused by tubercular infection of the suprarenal capsules (adrenal glands), so it may be possible to reconcile Cope’s diagnosis with Ms. White’s. As a good scientist I have to say that we are lacking in solid data! We will never have a definitive answer to her proximal cause of death, though it is certainly interesting to speculate. I must admit that I haven’t read the original article in Medical Humanities wherein Ms. White makes her case, but from the summaries I’ve read it sounds like her argument mostly consists of “Austen’s symptoms don’t match my own exactly. Therefore she did not have Addison’s Disease.” And while I willing recognize the insight gained by living with the condition oneself, that hardly qualifies her as an Addison’s researcher. I might just as well say that as a person with steroid-therapy induced adrenal insufficiency, I don’t feel all that well most of the time but I manage to get on with things; therefore the clearly smarter and more focused Miss Austen would have as well. A nice speculation, but not what reasonable people would call evidence. Why does it matter anyway? Certainly a sense of impending mortality could have influenced the tone of Persuasion. Or maybe a really talented writer decided to create a story that felt that way. People who write good fiction don’t have to experience everything they put their characters through. They may draw upon their own lives and observations, but they are professional makers-up of stuff. There’s a lot of that going around; for instance, in Carol Shields’ biographical book about JA, she opines that Jane died from breast cancer, as did Jane’s Aunt Philadelphia and cousin Eliza; but breast cancer runs in families on the female side, and there is no evidence of breast cancer on Jane’s mother’s side of the family (Philadelphia was Mr. Austen’s sister). Carol Shields, of course, suffered from breast cancer and sadly it was fatal in her case. But I really saw it as Ms. Shields projecting a bit. There was no real evidence other than seeing her own symptoms in Jane’s. I don’t know why Claire Tomalin disputed the original Addison’s findings. In the accompanying article by Ms. Tomalin, she states, “I always look at the medical history, and it seemed to me in the case of Jane Austen that people had rather seized on what Dr Zachary Cope had said and not questioned it.” Thing is, the diagnosis fits really well. I did a little (very little) research on Addison’s while writing the JA Handbook, just so I could write about the symptoms of the disease in the biographical sketch, and even that little bit of research convinced me–mainly because of the idea that stress exacerbates the disease and can even cause the patient to become symptomatic. It sounded exactly like what happened to Jane Austen. Stress, symptoms, untreated, death. Also, writing that her skin was “black and white and every wrong color” sounds a lot more like vitiligo (a symptom of Addison’s) than circles under the eyes. It’s clear from Jane’s writing that she was a glass-half-full kind of person, and also had little patience with those who milked illness for attention. She likely would have downplayed her own symptoms. Maybe she DID have a “thumping headache” but just didn’t like to make a lot of fuss about it.